I would absolutely love, love to have this!!!!! I drink Milk tea everyday, twice or three times a day even, but I Just use lowfat milk to top it off, mostly water and no sugar, so I get my water intake during the winter.. but Red Tea and Milk, are my favorite. I can't find these anywhere here, I might have to get you to send me some "wink"! Royal Milk Tea is certainly NOT a British thing - it sounds like something just invented to SOUND British. PS - love the site! Hi, Pegglass, and thank you for your kind comment and for reading! It definitely does appear to be an invention, though I can't say if the Japanese created it or someone else did. It does appear to be something which is not common in the West. RMT is usually made with Assam tea and spices, it's not what the English drink which is earl grey or english breakfast. In Nagano they make it up by hand from scratch right in front of you and it tastes delicious. I've never had milk tea anywhere in Japan that was as good as in Nagano. 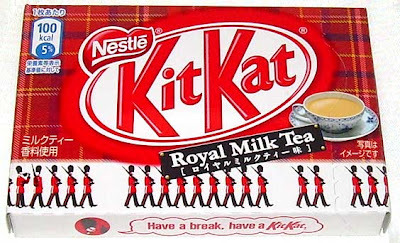 I hope they make a Nagano RMT kit kat. Hi, Rach, and thanks for taking the time to comment! I wonder how well these KitKats are selling because they're on sale at one of the Okashi no Machioka discount snack shops in my neighborhood for 69 yen. They're still in convenience stores though (at full price). hi! i'm british through and through and consequently am addicted to tea. just got back from a holiday in japan and discover the royal tea drinks. LOVE THEM!! yes, they are disgustingly sweet (especially the asahi brand), but the lipton one was very drinkable and VERY addictive. had withdrawal symptoms for my first few days back home. found the royal tea kitkats at the airport and thought 'bloody hell, gotta have one of those!'. but i stupidly only brought one and didn't crack it open til i got home. major regret. LOVE THEM!! can't believe how much they taste like royal tea. i will pay a lot of money for anyone to send them to me in australia. i so should have brought 100s! Hi, Leah, and thanks so much for taking the time to read and write such a delightful comment! 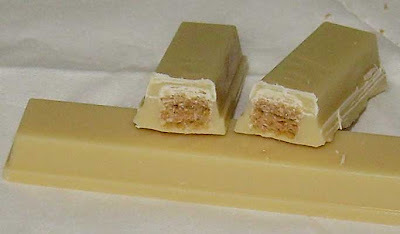 I think the Royal Milk Tea KitKats are actually going to be gone soon. They're still in some convenience stores, but the discount snack shop near my place had them on sale for 69 yen. That's generally a sign that they're liquidating their stock!